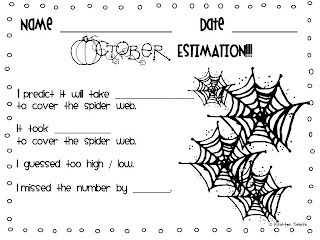 A Day in First Grade | Estimation and linky parties! I have been super busy in my classroom. I went for it and totally did away with any resemblance of desks! I now have two circle tables in my room and also a guided reading table. I am going full steam ahead and will definitely let you know how it works out!! — Pictures to come on Monday!! I am so close to being ready to get to the “fine tuning” phase and am so excited to get down to the nitty gritty!! 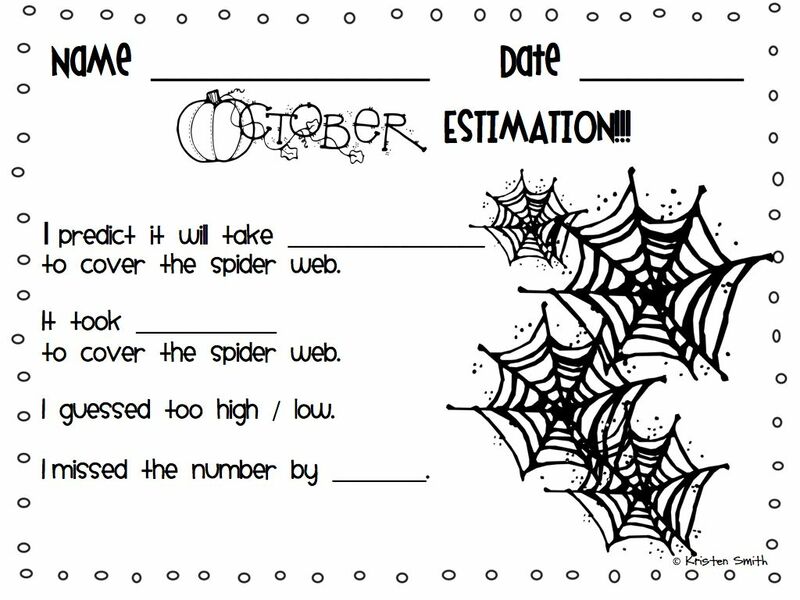 While reflecting on some of the things I need to add to my curriculum activities, I noticed that my first graders struggled needed more practice with estimation last year. 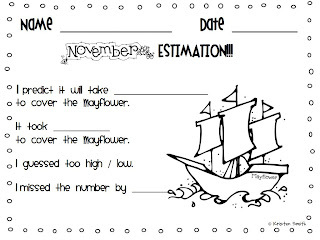 I created a new “mini packet” that will allow us to practice estimation every week. 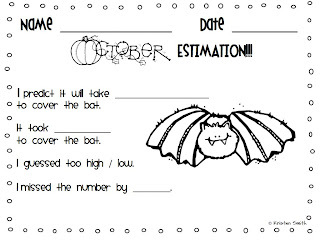 In order to help my class, we are going to have “Friday estimation activities.” This packet will go along with them! There are around 4 activities for each month from August- November. I hope it will help some of you!! You can download it <<here>> for FREE. I am joining TWO blog hops today!! where you share ONE memory about YOU from the grade you teach. Well, for me, the biggest stand out memory from my first grade year was that I got the chicken pox that year. Not only that, it was during Christmas time and I had to miss our Holiday party. I remember my teacher, Miss Hefflefinger came to my house (because my mom was the room mom) so my mom could explain the gingerbread house activity that my class was going to do. 3. Your teaching experience: This is going to be my 9th year teaching! I have taught kindergarten for 4 years, a third/ fourth grade combination class for two years, was a leader (aka “principal”) at the school I served at in the DR, and first grade! 4. When you started blogging: I created a blog a few months back but only recently started actually “blogging“! 5. Share a blogging tip / blogging resource: Jessica Stanford over at http://mrsstanfordsclass.blogspot.com/ has so many great “how to” techy things over at her site. She has helped me tremendously!! I hope you all have a fabulous weekend!! Leave some love!! 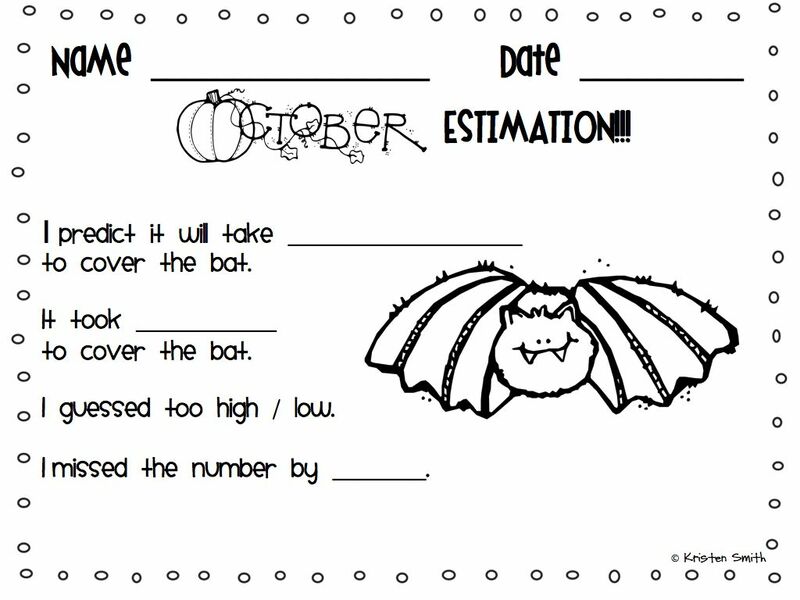 Cute, cute estimation pack. Welcome to the fun world of blogging. Awesome!! I’m so glad I could help!! 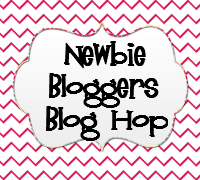 I just found your blog through the newbie blog hop! I am your newest follower! I hope you check out my first grade blog sometime too! I’m so glad you stopped by!! I for sure will come and check out your blog!! Found you through the blog hop & am now following you! Stop by my blog if you haven’t already had a chance and follow! That blog hop has brought me to so many great blogs– I’m heading over to yours now!! Hi…I just found your blog through the Newbie Blog Hop and am now a follower. I hope you will hop over to my blog for a visit soon. PS I emailed my asst. principal the other day and asked her to have my desks removed. Since I am going to be a resource teacher, I figured now was the time to see how I like not having desks. It’s something I’ve wanted to do for a long time. I’d love to know how it works out. Amy– I am loving what it feels like in my room right now!! I’ll keep you posted once the students start! Thank you so much for posting your freebie. I found you on the newbie blog hop and also work at a private school teaching kindergarten. Just found you on the newbie link up! 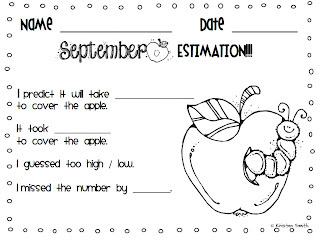 These are totally cute estimation cards. Thanks for sharing. Also, LOVE the pic of you in first grade. How sweet!! 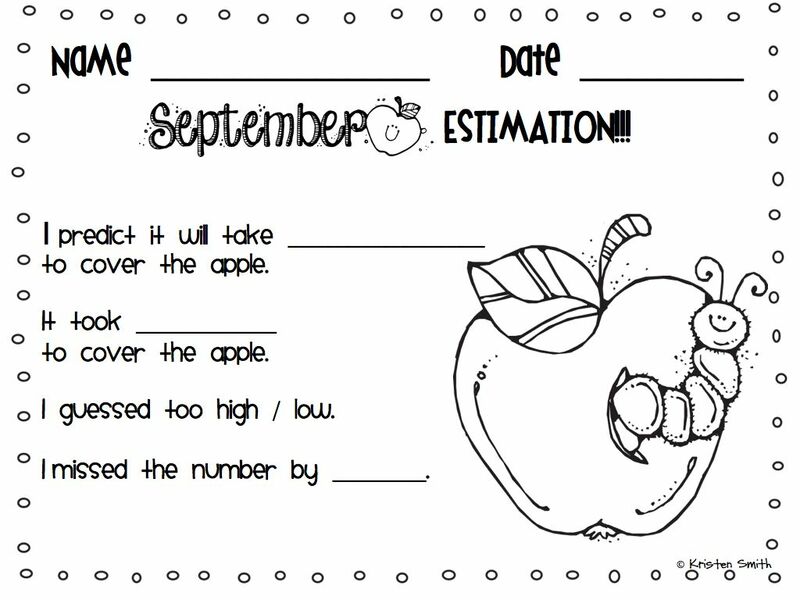 omgosh – LOVE these estimations!! I may just have to add the rest of the year to them…thanks for sharing Kristen!! I nominated you for two awards head on over to http://www.who-is-on-first.blogspot.com to pick them up! 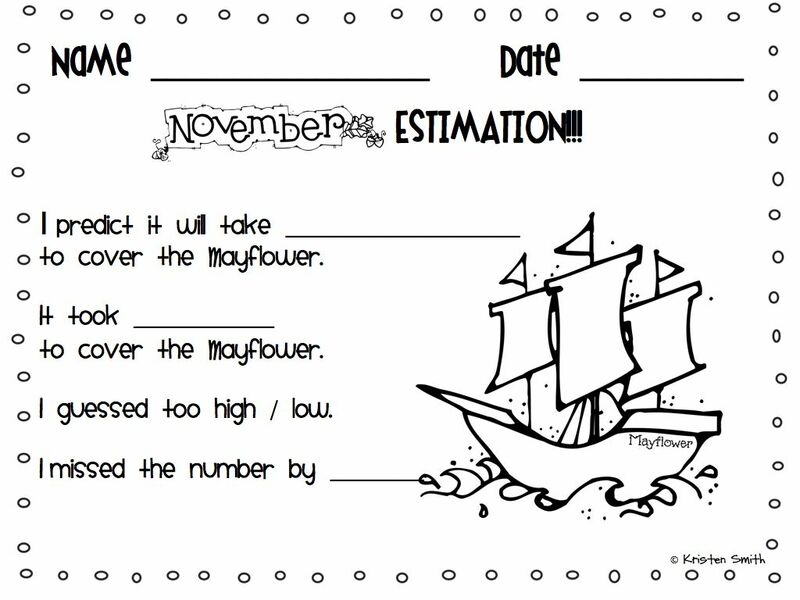 I love your estimation sheets! Would you happen to have any for the rest of the school year?